Daemon - A daemon is more or less the Unix/Linux equivalent of a service in Windows. It is an automated background process that manages resources, processes, etc. The names of most daemons end in the letter "d" such as inetd, ftpd, and httpd. DB Connector - Describes a series of port connectors for connecting devices to a computer. It gets its name because the connectors have a definite shape like a capital D (also could be called a trapezoid with rounded angles). Typically these come with 9, 15, 25, 50, or 68 pins and can be male or female depending on the cable's function. DDR SDRAM - Double-Data-Rate Synchronous Dynamic Random Access Memory is a type of memory integrated circuit used in modern computers. It achieves greater bandwidth than ordinary SDRAM by transferring data on both the rising and falling edges of the clock signal (double pumped). This effectively nearly doubles the transfer rate without increasing the frequency of the front side bus. Thus a 100 MHz DDR system has an effective clock rate of 200 MHz when compared to equivalent SDR SDRAM, the “SDR” being a retroactive designation. With data being transferred 8 bytes at a time DDR RAM gives a transfer rate of (memory bus clock rate) × 2 (for dual rate) × 8 (number of bytes transferred). Thus with a bus frequency of 100 MHz, DDR-SDRAM gives a max transfer rate of 1600 MB/s. The DDR SDRAM standard is evolving, from DDR to DDR2 to DDR-3. Default Gateway - A default gateway is a node on a computer network that serves as an access point to another network such as the internet. This node is usually a router. Demarcation Point – is the point of operational and administrative control change in a network. One example of this is the Main Distribution Frame (MDF) point in a facility. This is where the wire distribution frame for connecting equipment inside a facility to cables and subscriber carrier equipment outside of the facility occurs and this is considered a demarcation point of the operational control of the internal systems where it changes over to the control of the external presence. DES (Data Encryption Standard) - Created in the 1970's, DES was a widely-used method of data encryption using a private (secret) key that was judged so difficult to break by the US government that it was restricted for exportation to other countries. There are 72,000,000,000,000,000 (72 quadrillion) or more possible encryption keys that can be used. For each given message, the key is chosen at random from among this enormous number of keys. By current standards, DES is considered to be slow and offers weak encryption. EAS replaced DES as the standard for the U.S. Government. DHCP (Dynamic Host Configuration Protocol) - DHCP is responsible for automatically assigning IP addresses to computers on a network. When a client is configured to receive an IP address automatically, It will send out a broadcast to the DHCP server requesting an address. The server will then issue a "lease" and assign it to that client. DHCP can also assign other network parameters such as subnet masks and default gateways. DHCP makes network configuration easier and helps prevent the assignment of duplicate addresses. Distance-vector Routing Protocols – are one of the two main classes of routing protocols used in packet switching networks and includes Routing Information Protocol (RIP) and Interior Gateway Routing Protocol (IGRP). uses distance as one factor and the vector as the other to determine against the known routing tables to deliver data to source and destination locations. Routers using the distance-vector routing protocol will update other routers of topology changes periodically when a change is detected in the topology of a network. DSSS (Direct Sequence Spread-Spectrum) - One of two types of spread-spectrum radio technology used in wireless LAN (WLAN) transmissions. To increase a data signal’s resistance to interference, the signal at the sending station is combined with a higher-rate bit sequence that spreads the user data in frequency by a factor equal to the spreading ratio. It phase-modulates a sine wave pseudorandomly with a continuous string of pseudonoise code symbols called "chips", each of which has a much shorter duration than an information bit. That is, each information bit is modulated by a sequence of much faster chips. Therefore, the chip rate is much higher than the information signal bit rate. DSSS uses a signal structure in which the sequence of chips produced by the transmitter is known a priori by the receiver. The receiver can then use the same PN sequence to counteract the effect of the PN sequence on the received signal in order to reconstruct the information signal. See also FHSS. 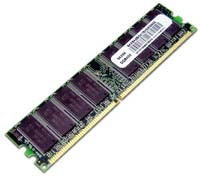 DIMM - Short for Dual In-line Memory Module, a small circuit board that holds memory chips. A single in-line memory module (SIMM) has a 32-bit path to the memory chips whereas a DIMM has 64-bit path. Because the Pentium processor requires a 64-bit path to memory, you need to install SIMMs two at a time. With DIMMs, you can install memory one DIMM at a time. DLL (Dynamic Link Library) - DLL files are used in conjunction with Microsoft operating systems and contain executable functions or data that is used by applications at run-time. These binary files can be shared by multiple applications at once in some instances, others are only used with one specific application. When an application utilizes a .dll file, the OS maps the DLL into the process' address space. When the application is terminated, the link to the .dll file ends as well. DMA - Direct Memory Access - DMA channels allow hardware devices (like sound cards or keyboards) to access the main memory without involving the CPU. This frees up CPU resources for other tasks. DNS (Domain Name System) - DNS is an Internet and networking service that translates domain names into IP addresses. The internet is based on numerical IP addresses, but we use domain names because they are easier to remember. DNS is the service that looks up the IP address for a domain name allowing a connection to be made. This process is very similar to calling information. You call them with a name, they check their database and give you the phone number. Domain Controller - On a Windows network, a Domain Controller is a server that stores the central database of users, accounts, security information, and other network resources. This central database was known as NT Lan Manager (or NTLM) in Windows NT. Newer Microsoft server operating systems such as Windows 2003 use a database called Active Directory. Each person who uses a computer that is a member of the domain, receives his or her own unique account, or user name. This account can then be assigned access to resources within the domain. Domain controllers are the servers that manage all security-related aspects of a user and domain interactions, centralising security and administration. Domain Name - See also Windows Domain. The most common type of domain names are hostnames that provide more memorable names to stand in for numeric IP addresses. They allow for any service to move to a different location in the topology of the Internet (or an intranet), which would then have a different IP address. By making possible the use of unique alphabetical addresses instead of numeric ones, domain names allow Internet users to easily find and communicate with web sites and other server-based services. As an example, it is much easier to remember the domain name "techtutorials.net" than it's corresponding IP address of 206.67.48.220. The internet uses DNS to make these translations between domain names and the associated IP address. Domain Naming Master - With regards to Active Directory, the Domain Naming Master FSMO controls the addition of Domains in a forest. This DC is the only one that can add or remove a domain from the directory. DoS (Denial of Service) - A DoS attack is a common type of attack in which false requests to a server overload it to the point that it is unable to handle valid requests. There are several different types of DoS attacks including Syn Flooding and Ping Flooding. DRAM - DRAM stand for Dynamic Random Access Memory and uses capacitors instead of transistors and switches. It needs to be constantly refreshed. DRAM is slower than SRAM, but is more commonly used for computers' main memory. Specialized types of DRAM (such as EDO memory) have been developed to work with today's faster processors. DSL (Digital Subscriber Line) - A technology enabling high speed data transfer over ordinary copper telephone lines that has become a common broadband internet connection in many homes. In addition to much faster speeds, DSL has been a remarkable improvement over dial-up because it allows simultaneous voice and data communications. xDSL refers to different variations of DSL, such as ADSL, HDSL, iDSL and RADSL (ADSL is the most common). DSL's biggest competitor is broadband cable providers. DVI-D - True Digital Video DVI-D format is used for direct digital connections between source video (namely, video cards) and digital LCD (or rare CRT) monitors. This provides a faster, higher-quality image than with analog, due to the nature of the digital format. All video cards initially produce a digital video signal, which is converted into analog at the VGA output. The analog signal travels to the monitor and is re-converted back into a digital signal. DVI-D eliminates the analog conversion process and improves the connection between source and display. DVI-A - High-Res Analog DVI-A format is used to carry a DVI signal to an analog display, such as a CRT monitor or an HDTV. Although some signal quality is lost from the digital to analog conversion, it still transmits a higher quality picture than standard VGA. DVI-I - The Best of Both Worlds DVI-I format is an integrated cable which is capable of transmitting either a digital-to-digital signal or an analog-to-analog signal, but it will not work transmitting a digital-to-analog or analog-to-digital signal.